I happened upon this title searching for narration by my favorite audio performer, the late Anna Fields. Seeking out her vast collection of work has led me in diverse directions, introducing me to many writers off my radar. This is a warm and witty saga about agribusiness, environmental activism, family and community - from the author of My Year of Meats and A Tale for the Time Being. Reminiscent of Jane Smiley's A Thousand Acres. 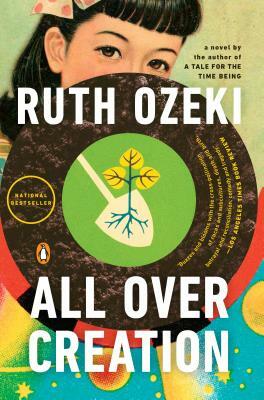 "With a combination of humor and pathos that is all her own, Ozeki brings the American pastoral into the age of agribusiness and genetic engineering. The result is a smart compelling novel about a world we don't realize we live in." - Michael Pollan, author of Omnivores Dilemma, Cooked, and Botany of Desire. Yumi Fuller hasn’t set foot in her hometown of Liberty Falls, Idaho—heart of the potato-farming industry—since she ran away at age fifteen. Twenty-five years later, the prodigal daughter returns to confront her dying parents, her best friend, and her conflicted past, and finds herself caught up in an altogether new drama. The post-millennial farming community has been invaded by Agribusiness forces at war with a posse of activists, the Seeds of Resistance, who travel the country in a camping car, “The Spudnick,” biofueled by pilfered McDonald’s french-fry oil. Following her widely hailed, award-winning debut novel, My Year of Meats, Ruth Ozeki returns here to deliver a quirky cast of characters and a wickedly humorous appreciation of the foibles of corporate life, globalization, political resistance, youth culture, and aging baby boomers. All Over Creation tells a celebratory tale of the beauty of seeds, roots, and growth—and the capacity for renewal that resides within us all.